Minecraft will help teach city planning to Swedish teens. Videogames are gaining more and more of a stronghold in schools. We've already seen how they can help out at the collegiate level, but one school in Sweden wants to see if a younger crowd can benefit from academic gaming. 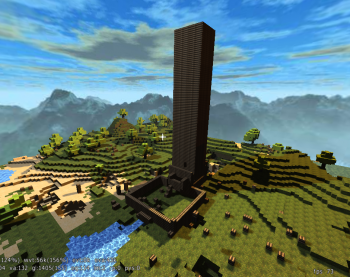 An international competition for city planning inspired instructors at the Viktor Rydberg secondary school to make freeform construction game Minecraft a compulsory part of the curriculum. About 180 students around 13 years old have begun to play - and work - in Minecraft at Viktor Rydberg. "They learn about city planning, environmental issues, getting things done, and even how to plan for the future," says Monica Ekman, a teacher. Her lessons in the game involve constructing realistic cities, complete with power and water networks. The game's strengths, according to Ekman, are its gender-neutral mechanics and aesthetic, and its focus on slow, gradual construction. "The boys knew a lot about it before we even started, but the girls were happy to create and build something too - it's not any different from arts or woodcraft." The "Future City" competition that inspired the event is an international challenge to teach students about the challenges and opportunities of urban engineering. While any competitor could theoretically use a Minecraft city in his or her entry, Viktor Rydberg is the only school to make it mandatory. Some parents expressed concern about devoting school time to a videogame, but Ekman stands by her program, and her students' results. "We think it's a fun way of learning and it's nice for the students to achieve something." Designing a virtual city is only one component of the "Future City" competition, which also requires a research essay and a physical model. That said, Minecraft is as good a tool as any to conceptualize all the moving parts a realistic urban environment might need to work. As for the students, schoolwork is still schoolwork, but getting down and dirty with a virtual pickaxe beats toiling over a worn piece of graph paper any day.